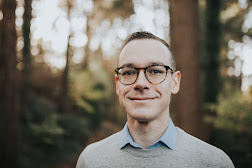 I recently left a ministry role at a church. It wasn't an easy or simple decision to make, but it's also not the first time I've stepped away from a ministry. In volunteer and paid ministry roles, I've served at five different churches, meaning I've had to leave a church on five occasions. Each time has been incredibly difficult and emotionally taxing, but each time has also led to new relationships, opportunities, and lessons God had in store. Over the last decade, I've also had numerous ministry friends go through transitions into new roles, usually in locations and positions they probably next expected. Sometimes it was a healthy move; other times it proved to be a painful decision. If you choose to enter full-time ministry as your vocation, you'll eventually have to face this question: should I stay or should I go? It could be due to all sorts of factors--a new job offer, a family crisis, lack of chemistry in the current ministry, serious conflicts with boss or co-workers, or it just feels like "it's time." 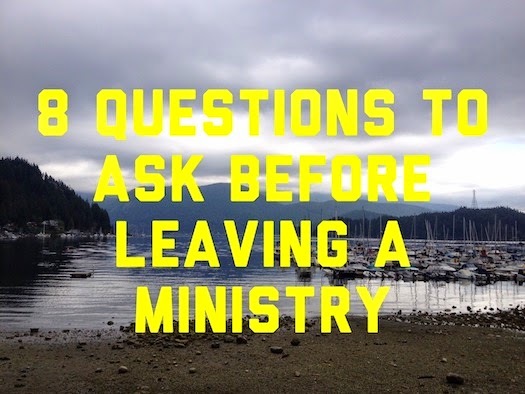 How do you know when to leave a ministry position and when to stick it through? Do you need to move on to something else, or should you remain faithful where you are? It can be difficult to discern what you need to do and what questions to ask. 1. How is your relationship with Christ? Are you sure you're hearing him, or just your own inclinations and desires? What have your recent prayer conversations with God been like? What passages of Scripture has he been guiding you to read and contemplate? Is there any underlying sin in your life that requires confession and repentance? Are you in tune with the Holy Spirit? 2. What are your motives? Fear? Frustration? Financial burdens? Desire for greener pastures? A new vocational direction? To be closer to family or friends? Has something drastic or painful happened recently? Being honest and clear about your motives--all of them, good, bad, and ugly--will help in the discernment process. 3. Have you been led somewhere new? Has God pointed you in a different direction, opened up a new role or church, or given you a vision for the next season? Are you headed in a clear direction, or is there just a sense that you need to stop what you're presently doing? 4. Have you been released from where you are? Has God given you a sense of peace when it comes to leaving your current ministry? Or is there a lingering sense that you need to stay there, even when it's difficult or counterintuitive? 5. How well is your fit? Are your values and the church's/other leaders/elders values and mission in alignment? If they're not, even every so slightly, you'll find yourselves headed in different directions and drifting from each other, creating long-term frustration. What needs to change in your own habits, desires, and passions in order to find alignment? 6. What is God telling your trusted community? Your spouse, your mentors, your faithful Christ-following friends who know you best--what do they think of your decision? If they bring up a number of red flags or concerns, those are worth paying attention to. Especially listen to your spouse--you should be making this decision together, and only with whole-hearted unity. I highly recommend the clearness committee, a Quaker discernment process for making big decisions. The best gift you can give your marriage is a healthy self. The best gift you can give your family is a healthy marriage. The best gift you can give your community and ministry is a healthy family. Care for your own soul so that you can serve faithfully for the long haul. Even if you're single or don't have children, the above still applies--love others well out of a healthy self. 8. What was the last clear direction God gave you? When I was discerning whether or not to step away from my position in my last church, I made two lists. The first was a list of the things God was clearly guiding me to do--and when I say "clearly" I mean, I can't shake this thought and feeling, others keep affirming this direction, my readings in Scripture seem to point this way, and I feel like I would be acting in disobedience to *not* act accordingly. Clarity doesn't always mean absolute surety or absence of doubt, but it does mean that there's a strong sense of God's will in the matter. This first list is typically quite short; for me, it was only three brief sentences. The second list includes all your dreams, hopes, options, and intuitions about what God might be up to (emphasis on might). This list was much longer--about 15-20 items--but they were all just prayerful hunches and conjecture. I had to go back to the first, clearer list: what was God prompting me to do, and was I willing to obey? More than anything, Jesus's prayer in Gethsemane applies here: "Not my will but Yours be done." Find alignment with God's desires and relinquish your own plans to His good, pleasing, and perfect will. The decision to leave a ministry is always a struggle, but it's also an opportunity to draw nearer to the heart of Christ. Which question resonated with you the most? What questions would you add to the list?